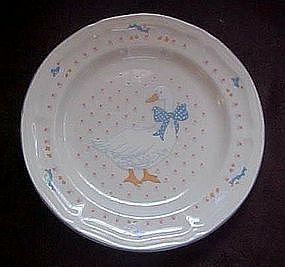 Stoneware in the Aunt Rhody blue goose pattern by Brick Oven. These are the 7 5/8" salad plates which are identical to the ones made by Tienshan. Pink calico hearts background, white goose with blue polka dot bow and blue edge trim. I have 7 available in this brand and more in the Tienshan brand. All are perfect, and price is for each.